If the Kia Kee Sports Coupe Concept car is any indication of where Kia's design in terms of cars is headed, then the future is looking mighty good for this company. According to Kia's spokesperson, the Kia Kee communicates the design language that will be seen in all future Kia products. All I have to say is--about time. 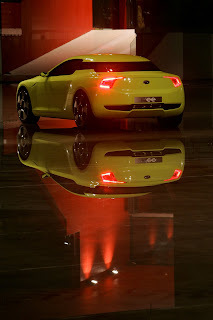 Kia cars are usually a bore to look at but the Kia Kee Sports Coupe made me did a double take. It has sleek lines and proportions and has a nice yummy yellow color, though I prefer my sports cars in red. The Kia Kee Sports Coupe has a V6 engine and a 2.7 liter MUE-II engine that can produce 197 horsepower, very fitting for a sports coupe. When will we see the Kia Kee off the drawing board and into our roads? Kia only knows.